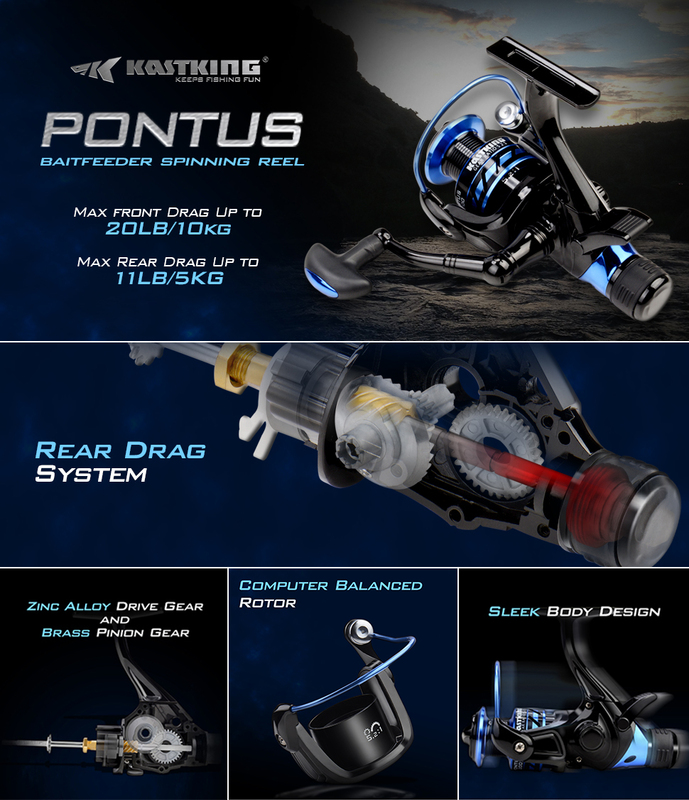 AFFORDABLE OPTION - The KastKing Pontus bait feeder front and rear drag fishing reel offers a great choice for freshwater live line fishing. 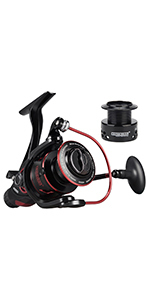 Compare the incredible low price of a Pontus Baitfeeder to other brand fishing reels. GREAT FEATURES - 9 +1 MaxiDur Corrosion Resistant Ball Bearings, CNC Aluminum Spool, 3 sets of Drag Washer Discs, Alloy Gears, CNC Aluminum Handle, Rust Proof Body and Side Covers. POWERFUL - 4.9:1 and 5:2:1 gear ratios for fishing with heavy baits and up to 26.5 lbs of drag to stop big fish. Boom! See specs below. VERSATILE - Available in sizes 2000, 3000, 4000, 5000 to match the species whether you are live lining shiners with spinning tackle for bass fishing or large trout fishing or fishing for species that devour live bait including catfish, walleye, striped bass, yellow perch, pickerel, pike, musky, crappie, bowfin, snakehead, gar, or others. 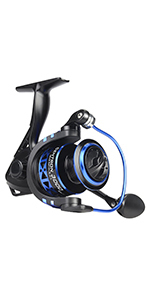 FRESH LOOK - Fantastic black and blue cosmetics wrap around this outstanding live lining style spinning reel. One-year warranty. KastKing is an ICAST Best of Show Award-Winning Brand. 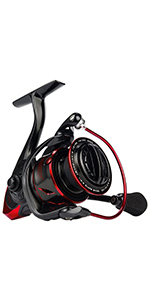 Anglers asked for innovation in a bait feeder spinning reel and KastKing delivered! 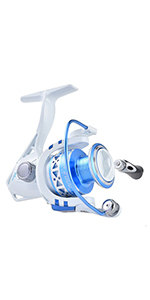 The KastKing Pontus Baitfeeder brings a freshwater spinning reel to the fishing tackle market that offers top quality and great features. 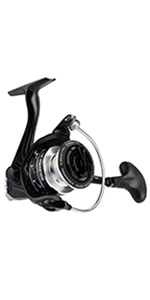 Compare to other brands that offer fishing reels for live lining bait and save more! What’s more, you will want the great looks of a Pontus on your spinning rod. Use the amazing live liner spool feature to let your line run with live bait or your catch after it takes your bait. A flip of the rear drag control lever or a turn of the handle engages your front drag. Four sizes 2000, 3000, 4000, 5000 match the species whether you are live lining shiners in freshwater with spinning tackle for bass fishing or large trout fishing or fishing for freshwater species that devour live bait or cut bait including catfish, walleye, striped bass, yellow perch, pickerel, pike, musky, crappie, bowfin, snakehead, gar, or others. Even use it for ice fishing. KastKing keeps fishing fun! Caught a 24 inch catfish with this reel. So yea it can do the job. I picked this real specifically for flathead catfish. I bought the 4000 and has worked flawlessly for two seasons now. I’m thoroughly impressed be this reel for the price range it’s in. 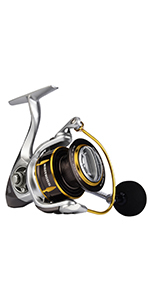 I have spent three times the cost on a few other name brand reels of this kind and feel this reel is comparable. This is a 5 to 1 ratio reel, but works amazing as a bait runner. Had my first use with KastKing Baitfeeder with their 10lbs braided while sturgeon fishing and I was happy with this setup. Love KastKing so far and plan to use more of these products. I use this rod along with my iFish and it’s truly amazing. I would recommend getting a longer rod ,36” and above with this however because it does have some weight on it.